Even after she was grown and had made a home in Alexandria Virginia, with her husband Ad, Jill Eichner’s childhood ties to a lake in northern Michigan tugged at her heart. Jill’s father purchased a large piece of property on Walloon Lake in the northernmost part of the lower Michigan peninsula in the 1960s. The spot would become the site for childhood camping trips and fond memories. “I grew up in Ohio, but we spent summers and holidays at Walloon Lake, and my father still lives in a cottage there,” Jill explains. Fifteen years ago, Jill and Ad purchased an acre lot from her father with hopes they might someday build a vacation residence there. While Ad was browsing the internet for different design options, he came across Japanese-style homes that used post-and-beam construction topped with overhanging roofs. The entire concept so impressed the couple that they began pursuing ideas and talking with people whose Japanese-style homes had been featured in magazines. They adopted this style as the overriding theme for both the interior floor plan and exterior decks. 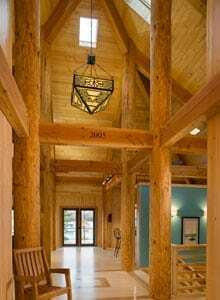 A search through issues of Timber Homes Illustrated helped them design their home and select Riverbend Timber Framing to produce their frame. Although Riverbend has a variety of stock floor plans from which to choose, none matched the exact style they had in mind. Fortunately, Riverbend was willing to adapt the design into a workable timber frame structure. Over the course of the next several months, the Eichners corresponded extensively with Riverbend’s design team to refine the drawings. The couple’s search for a general contractor was short: Jill’s father referred them to Dave Fiel. The couple never went through a formal bidding process or signed anything with Dave, instead they operated on a handshake agreement. “We are city dwellers and this property is rather rural,” Ad says. “We had never had a well for water and a septic field so we were totally in the dark about what to expect.” The couple was also unfamiliar with local rules, officials and subcontractors. “We relied on Dave to help us navigate through the maze,” Ad says. “We were pleased to discover that our Walloon Lake home follows the basic principles of Vedic architecture, without having planned it that way,” Jill says. The principles that Ad and Jill had unknowingly incorporated in the 4,000 square foot home included orientation of the building facing the sunrise, placement of rooms around a central open area – the “heart” of the house – natural sunlight illumination, construction using natural building materials, and an almost seamless flow form indoors to outdoors. 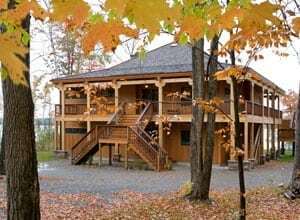 In order to get an elevated view of Walloon Lake from the main living areas, Jill and Ad placed the living spaces on the second floor with decks on three sides. The decks are connected to the indoor space by French doors to carry out the Vedic principle of natural flow from indoors to outdoors. “After pouring the foundation, we erected the four 38-foot structural round logs to support both levels of the 40-by40 square foot central core. Then we built the remaining timber frame around the posts,” Dave explains. These four posts visually divide the space between the entry, living room, kitchen and dining area in the second story. A side wing houses the master bedroom on this same level. 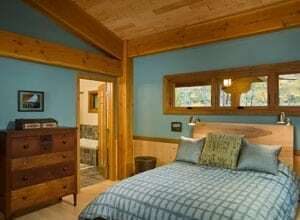 The lower level is devoted primarily to sleeping space for the couples three children – daughter Kyle, and sons Jim and Alec, 17, 16, and 12 years of age, respectively. Kyle’s bedroom suite, the largest of the three bedrooms in the walkout basement, is positioned underneath her parents master suite in the side wing. Jim’s and Alec’s bedrooms are in the central core portion, which contains two full bathrooms, one of which adjoins Jim’s room. This bath is accessible from lake side for use after a day of water recreation and is divided into two smaller rooms – one with a shower and the other with a half bath. A laundry/storage room completes the configuration of this level. A small trap door in the floor of the laundry room allows entrance to a crawl space that keeps the home high and dry and provides rough storage space. Ad says the crawl space has become a favorite play spot for younger guests at the lake. Four separate staircases contribute to a smooth flow both within and outside the home. In addition to the main staircase connecting the interior floors, Jill and Ad included a stairway on the exterior from the deck to the lawn on the lakeside. Another exterior staircase connects the first-level parking area to the second story kitchen. Finally, a double stair outside leads guests up to the main entrance on the second floor. To increase their ability to enjoy their vacation home year-round, Ad and Jill installed in floor radiant heat and three fireplaces; two indoor gas units and one outdoor wood-burning fireplace on the upper deck. The fireplaces in the living room and on the deck were finished with cultured dry-stack ledgestone. Cultured river rock adds a different style for the fireplace on the first-level family room. The home’s eclectic décor mixes antiques with modern, kid and dog-friendly furnishings. Jill incorporates the Vedic principle of natural ornamentations in the accent pieces by purchasing rugs that are either cotton or wool. Wendy Reeve of Cottage Interiors in Harbor Springs, Michigan, assisted in selecting wall colors and custom cushions for the window seats in the living room. To further carry their Japanese-style into as many details in the home as possible, Ad and Jill engaged Fred DeNise of Boyne Falls, Michigan, to craft their interior doors with an Asian design. Fred also fashioned the bed for the master bedroom and a hanging bed for their son Jim. Throughout the building process, Ad and Jill endeavored to find talented craftsmen who would understand their vision. One such person was Bonnie Hill at Preston Feather in Petoskey who assisted the Eichners in selecting the materials for the baths. Additionally, she drew the kitchen layout and served as both the interior designer and decorator for the kitchen. Ad says the home is very comfortable and requires very little natural gas to heat. Because of the wide roof overhangs and the homes Insulspan Structural Insulated Panel (SIP) walls, its quiet and stable as well as being energy efficient in all seasons. The family only had to use the air-conditioning system once last year. Enjoy more photos of this home in the gallery, Petoskey, Michigan Residence.